The average service based business, whether it is a stand alone business or a multi-location business, lives and dies on leads. Internet marketing is designed to drive people (leads) directly to your business. We use various methods, like SEO and PPC, to drive traffic to your site. But what happens after the click? 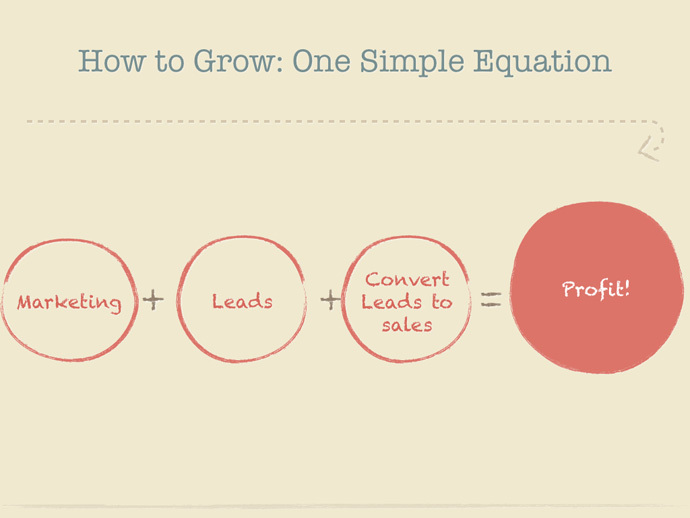 How do you convert clicks into sales? 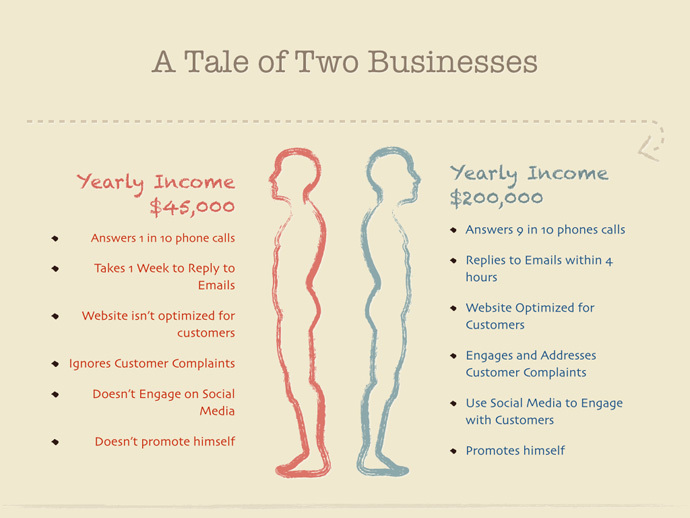 Turns out for a lot of small service based business the answer is simple: Answer the Phone. Seems obvious right? But we find that a lot of small businesses forget this simple rule. They instead treat 100 leads a month the same way they treat 2 or 3 leads a month. “Oh, I’ll call these people back next week.” Meanwhile those potential customers are seeking out that same service from other companies who are picking up the phone. Let’s take a look at two businesses, offering the identical service. One makes about $45,000 a year, the other makes $200,000 a year. What are some crucial differences? Milestone SEO specializes in handling service based businesses, like construction, HVAC, and roofing. Several years ago a small Mom and Pop Roofing company in the San Fernando Valley hired Milestone SEO as their internet marketing agency. The roofing company had officially incorporated in January. Since then they took in on average about 2 to 3 leads per month. They would average about 2 jobs (sales) per month. 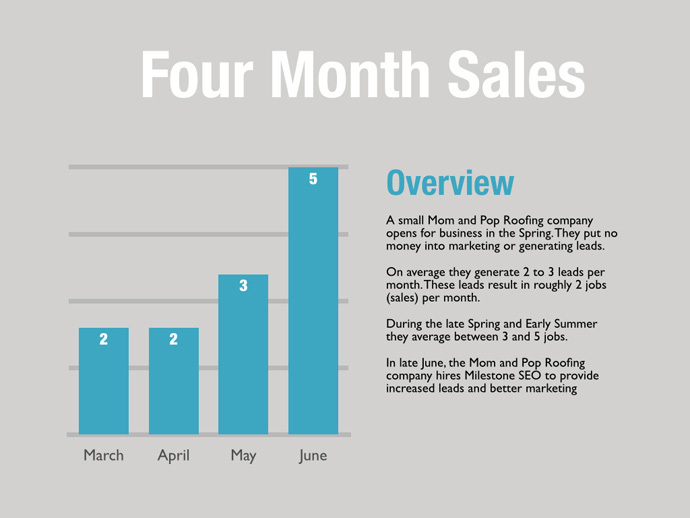 As summer rolled around their average leads increased to 4 to 6 a month, and by June this Mom and Pop Roofer was averaging 5 jobs a month. In Late June, they hired Milestone SEO as their internet marketing agency. Over the span of three months Milestone SEO was generating about 100 leads per month. So, imagine the surprise, when the owner of our Mom and Pop roofing company called us to complain that he was still doing about 5 to 7 jobs a month and he was only converting about 5% of his leads into jobs. 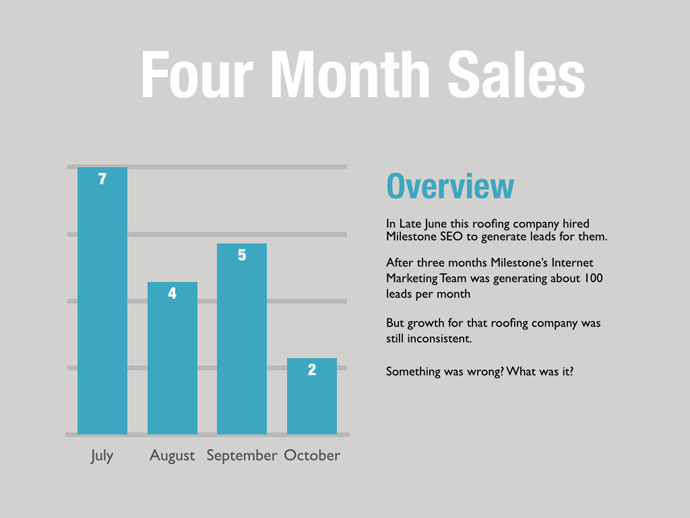 Our internet marketing team went to work auditing both the Roofing Company’s PPC and SEO campaign. Was the Phone Number Displayed Prominently on the Website? Were We Targeting Strong Key Terms? Were We Providing Useful Information to Website Visitors? Were People Spending Time on the Site? How Long Does it Take to Answer Your Phone? About once a day. The rest of the calls he’d let go to voice mail and try to call back a week later. Some calls he just never returned. Milestone SEO had done its job, we had generated tons of leads. But we had not properly prepared a very small business to handle 100 or 200 leads a month. We had overlooked the obvious. Our marketing team advised that the owner to set-up a solution to answer the phone immediately. We helped the roofing company set up a rudimentary call center at his home. The owner of the roofing company recruited his Wife and later his Aunt to answer the phone. They went from answering 1 in every 10 phone calls to answer about 9 in every 10 phone calls. 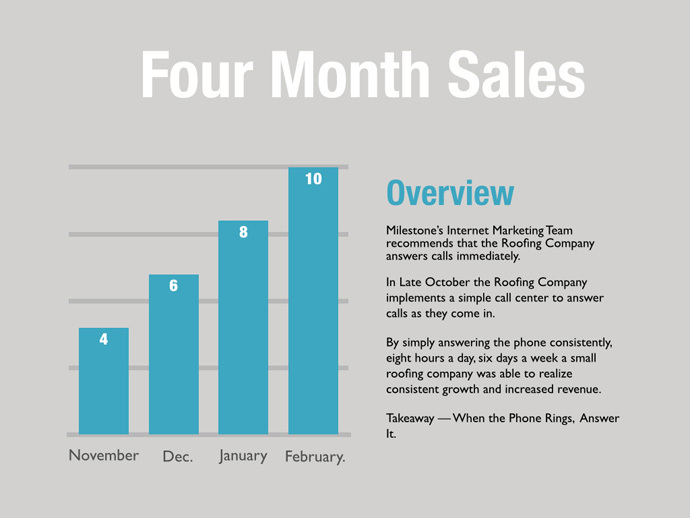 Without anything else, this roofing company was able to realize consistent month to month growth. Now that roofing company has an office, a call center, and is actively expanding to locations across Southern California. They went from revenues of $20,000 a year to revenues of well over $100,000 a year. Effective marketing is the cornerstone of any service based business. Marketing generates leads, builds brand awareness, and creates a bond between you and your customer. But a key component of any marketing strategy is conversion: taking a lead and turning that lead into a loyal customer.